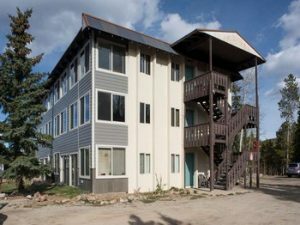 Tyrollean Terrace condominiums in Breckenridge Colorado real estate are conveniently located in the Town of Breckenridge. Minutes to downtown and just steps to the bus route, enjoy easy access to the Breckenridge Ski Resort ski slopes, dining and shopping. The Lodge at Breckenridge is within walking distance with terrific dining options and sweeping mountain views. The Tyrollean Terrace condos consist of 61 privately owned residences housed within 5 separate buildings on Overlook Drive, Boreas Pass Road and Hummingbird Drive. The residence sizes range from one to three bedroom units. Most of these Breckenridge condos have great mountain and ski resort views and the HOA dues cover heating. These Breckenridge condos offer nearby hiking and biking trails and boast a peaceful setting in a great location. Outside of being one of the most popular ski resorts in North America, Breckenridge offers a real town with year-round residents, lively nightlife, and a rich historical culture. To discuss your Breckenridge CO Real Estate search, inquire about a specific property or for local market data contact Justin and Krystal Knott with LIV Sotheby’s International Realty at 970.333.9050 or email at knott@sothebysrealty.com.